On Bitchin' Kitchen (The Cooking Channel) she made this amazingly, refreshing looking salad. It had blueberries, pomegranate seeds, a crisp and lemony pita, mint, and a middle eastern cheese I've never heard of. It sounded SO GOOD, never mind that I could obtain almost none of these ingredients. 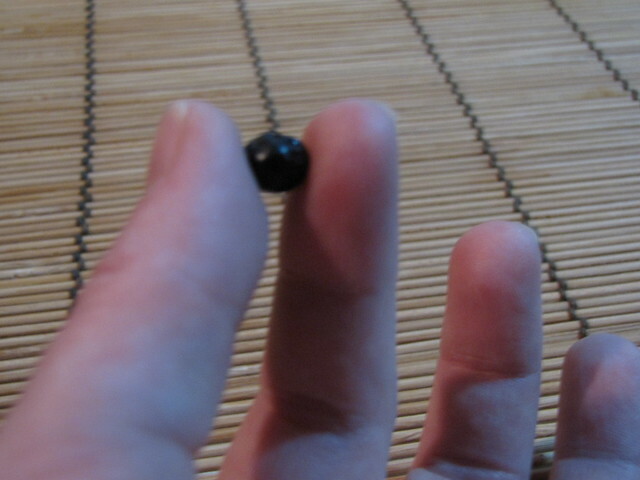 Note the size of an Ecuadorian blueberry. A "big" one is about the size of a lentil and they range down to much, much smaller. They don't come in neat little styrofoam and plastic wrapped packages. Instead you buy them by the pound, which is approximated by the seller's hand, and almost each little berry has a stem that must be removed from each, one ... by ... one. Also must be removed are stems and various larger twigs that make it into the batch. Only after this arduous process, following by a dip in a special cleaning liquid that is needed for any fruits or vegetables eaten fresh, are they ready for use. This salad better be worth it! But oh it was. It was deliciously zippy and tangy and made it just possible for me to imagine I was eating at an outdoor picnic in Chicago, thanks in part to the one good nectarine I scored as well. I couldn't get enough of the crunch and burst of berry flavors. The nutty cheese was a beautiful compliment to all that brightness. Squeeze about 2 Tbs. lemon juice, remaining olive oil, and a pinch of salt and pepper in the bottom of your serving bowl. Whisk lightly. 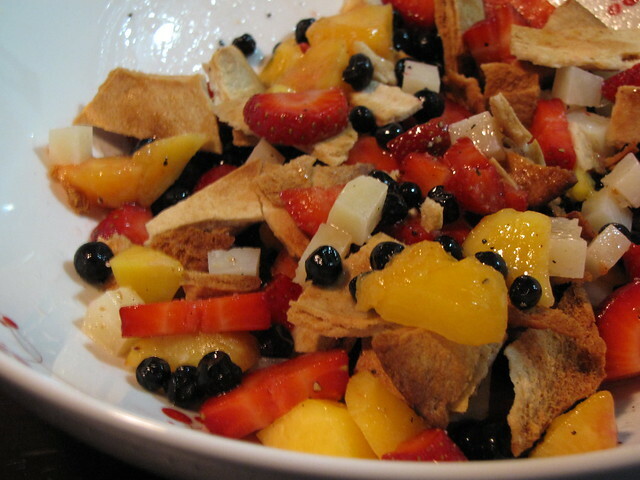 Just before serving, add fruit and cheese to the bowl. Break up your crispy into bite-sized pieces over top and mix all together. Serve immediately before sogginess ensues! You don't have to dip the blueberries in your special cleaning liquid. Anything with a smooth skin can just be washed in dishwashing soap in a pan of water. Those stems are a pain to remove, but that's a job for the maid or for doing when you're watching TV or doing something else. I can't find manchego, either. Yep, we can get it. It's pricey but every once in a while ... Especially when feta and brie taste nothing like feta and brie from the US! Let's definitely have blueberries together in August, k? Our madre makes a yummy, yummy blueberry and peach parfait that you and I would love for the fruit and vanilla bean included and FP would love just for the puddin'. Dad would love it because he loves dessert and most everything his wife makes and mom would be bored to make the same ole thing but pleased that we are requesting it :) The end. I remember those blueberries! When I moved to the states the big ones seemed so foreign to me. And now they are one of my favorite fruits. I could eat a whole pint in one sitting. Mmmmm. Blueberry pie. Wait, can you get manchego? I can't find it here, so if you can get it, you are one up on me.